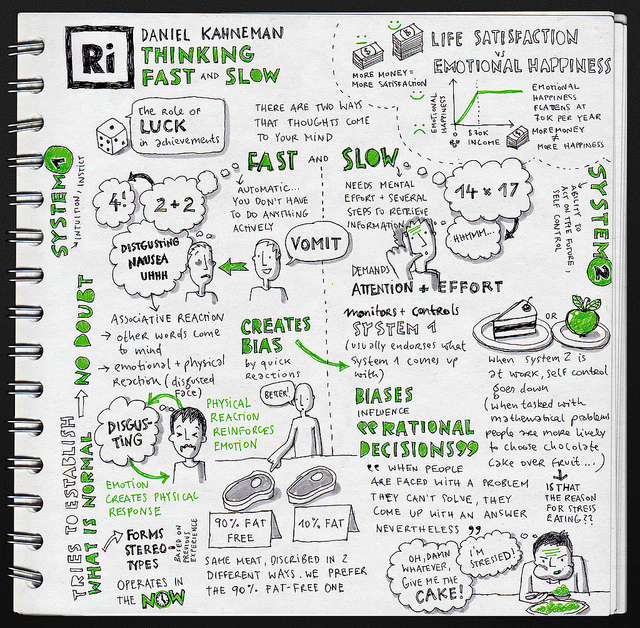 In his landmark book Thinking, Fast and Slow, Daniel Kahneman changed the way millions of people thought about their brains and caused headaches for a lot of market researchers in the process. What does it mean for market research? Traditionally market research methodologies have assumed that System 2 is the driver of brand and purchase decisions. Recent evidence that many purchase decisions are driven by System 1 is at odds with this attitude, although just how far it plays a role is still a topic of (vigorous) discussion. Complicating this issue further are the number of inherent biases and cognitive short-cuts inherent to System 1. In this post we will explore some of the prevailing thinking about how Khaneman and Tversky’s work has influenced understanding of the consumer decision making process, as well as the methods used by researchers to explore product & brand decisions. What does it mean for our understanding of the customer decision making journey? Stepping back from Behavioural Economics and academic understanding of human behaviour, Kahneman’s research has also driven significant change in how we understand the way customers interact with brands and make decisions. The older, more linear consideration funnel for a purchase decision has been complicated by two- way communication and a proliferation of information sources beyond brand marketing and advertising messaging. McKinsey’s have developed a new model that is more nuanced and begins to work in some of the ideas of BE in the low consideration, automatic loyalty loops, and a System 2 driven active evaluation pathway. The relationships between those forces are shown in the diagram below. Whether active evaluation is ever circumvented by a brand-based subconscious decision is a point of contention. Some sources will argue that up to 90% of decisions are made subconsciously and 95% of purchase decisions are System 1. Robust discussion continues on these figures, but everyone agrees that there is a balance of rational and instinctive behaviour in purchase decisions. Kahneman himself summarised decision making as “a proper mix of intuition and reasoning”. So how do we judge the influence of System 1 and 2 in purchase decisions? Some argue that System 2 rules for expensive purchase decisions, like buying a new car or choosing a college. But anyone that has gotten lost in an Amazon maze while comparing new phone cases, or spent 5 minutes in an aisle choosing between a range of supermarket products, might take issue with the bar being set quite that high! There is definitely a strong argument for smaller purchases being governed by system 1. Gut feel, familiarity and loyalty loops are far less energy intensive than an in-depth comparison of butter options every supermarket trip. For small items, ‘just because’ is an understandable explanation, what you see is al there is. This has implications for the way brands need to approach their audience. Leading brands with a well established relationship with consumers win through system 1 thinking. People reach for what’s familiar, without thinking and without comparing. This is earned behaviour and response through years of investment in brand, product experience and messaging. Badly judged changes to their winning formula can cause huge problems - think the ‘New Coke’ fiasco! For challenger brands to break through these attitudes they need to encourage comparison. By facilitating the slow, deliberate rationalisation of System 2 they get the chance to break through instinctive behaviour and beat out or supplant established products. In this context, how should we think about the customer journey and the role of System 1 and 2? Below is another diagram of McKinsey’s customer cycle with a few components and steps broken out - courtesy of Millward Brown. Developing subconscious preferences for brands through brand associations (biases) generated from past experience, brand marketing and advertising, and word of mouth and social media. The loyalty loop, here labelled heuristics, which kicks in for smaller and familiar purchases where expending energy on system 2 decision making is a waste of effort. The shopping experience itself - through product and packaging design as well as displays and the design of retail spaces themselves. All of these aspects can tap into system 1 to make product selection effortless, or kick into rational comparison and selection if desired. There are a range of methods aimed at delving into System 1 biases and cognitive short-cuts. These range from physical measurements using fMRI and EEG, implicit research, projective methods and prediction markets. There are also arguments that the measurement of System 1 influences and behaviour should be biased towards quantitative methods. However none of these techniques are without problems and it’s important to remember that the System 1&2 thinking and behaviour economics theory shouldn't be treated like a technology. There’s no definitive one-size fits all platform or approach for consumer decision-making analysis and it’s important to remember that the methodologies employed by Kahneman and Tversky to develop this way of thinking were cleverly constructed ‘old fashioned’ surveys and interviews. With a clear understanding of cognitive short-cuts and BE theory, researchers can devise elegant research approaches using a broad tool-kit of methodologies. The good news is that System 2 purchases can be analysed easily through the use of System 2 techniques, from traditional focus groups and interviews to modern on-line, mobile and auto-ethnographic approaches (including video, of course). Larger purchases, complex product or brand offerings and crowded marketplaces are ripe for slower, deliberate decision processes. For brands there are a number of opportunities to win a customer during this process - and the best way to understand rational choices in through rational research methods. Developing conscious brand associations from past experience, comparison, research and news. 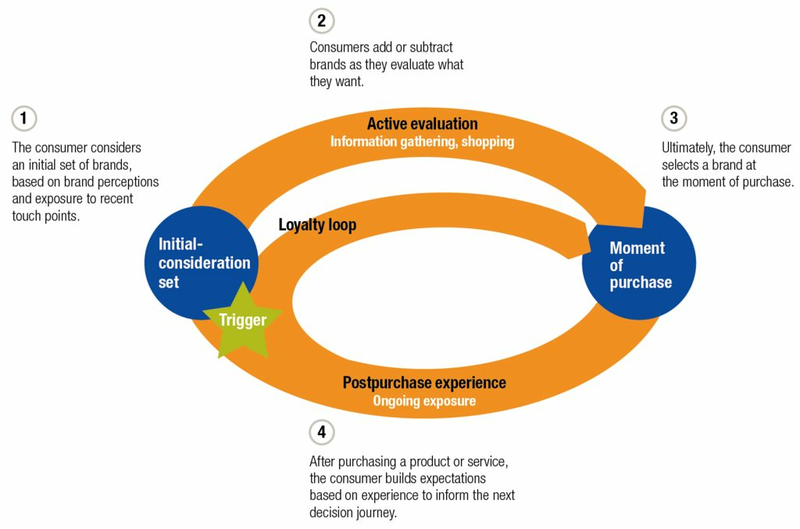 Research, development of a considerations set, comparison and selection during the active evaluation loop of the customer journey - including the choice of where to purchase products. 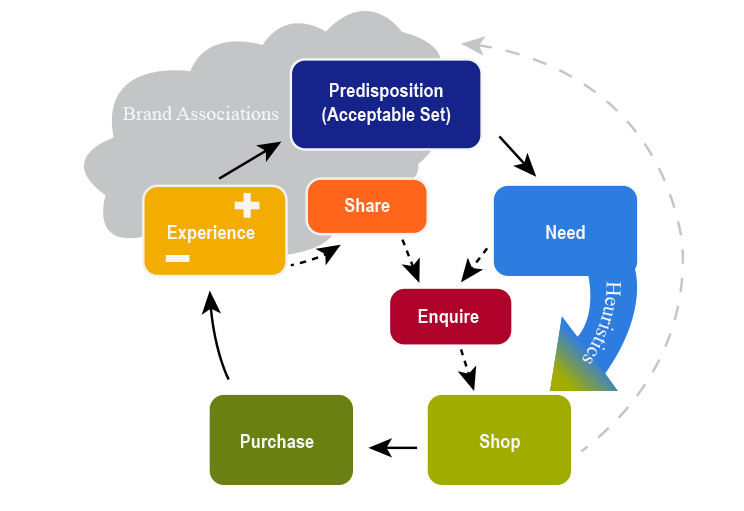 Sharing resulting brand and shopping experiences through the plethora of channels available to customers that did not exist a generation ago - simultaneously influencing peer brand associations. It’s also important to realise that there are a significant proportion of smaller purchase decisions where System 2 is engaged. In a recent project with a US based client, Thoughtmatter, we asked 35 millennials over 2-6 weeks to document on video any non-grocery purchases in brackets of >$25, >50, >$75, >$100 and >$500. Of the hundreds of purchases documented, around 40% were the reported result of deliberate research, comparing prices and reading up on user reviews on sites like Amazon. This rose to 65% for purchases over $500. The next two most important factors in influencing a purchase were straight price comparisons (22%) and brand (16%). It was intriguing to see the range of System 1 and 2 behaviour across the different price levels, from intensive research into $25 make-up sets through to a spontaneous purchase of a redundant deep fryer for over $200. The latter respondent could not define the rationale behind this purchase. “I was kind of at a loss of why I bought that, I already have one and it cooks very unhealthy food”. This shows that people can spend significant time and mental energy researching, comparing, rationalising and choosing products right across the price ranges in question. There is ample scope for System 2 approaches to delve into these decision making processes for non-staple products, and challenger brands in staple categories might find triggering System 2 their most viable play. Finally - where does video make the biggest difference? Video allows us to see which products are overlooked and how the positioning on a shelf or design will make them notice a product they don’t usually consider. At home it allows researchers a window into people fridge’s and pantries - capturing real context rather than relying on self-reporting and memory. User video also removes other factors that might influence participants (e.g. a person watching you talk, having to go to a hotel or fieldwork facility to answer questions) and it allows for diarising around a topic of interest to capture implicit reasoning and justification. Until there is a way to plug directly into the consumer mind, Matrix style (and we know how well that turned out anyway), there’s likely to be no single perfect market research approach. Researchers need to carefully consider the nature of the consumer decisions at the heart of their business challenges and match them with appropriate methodologies and frameworks.